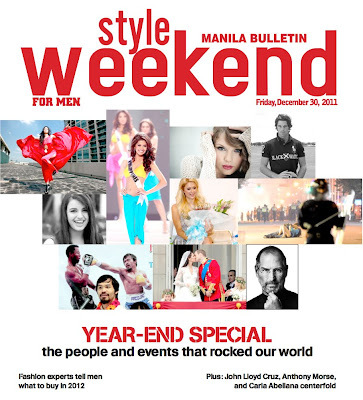 pls buy manila bulletin today (dec 30) for your free copy of style weekend for men (every last friday of the month)! on the cover: the people and events that rocked our world! welcome to our year-end special. also in this issue: last-minute suggestions on where to spend NYE, the fashion experts tell men what to add to their closets in 2012, fragrances and grooming stuff, profiles on john lloyd cruz and anthony morse, carla abellana centerfold, lust page turns into a list page, and more!